It's no secret that I am no cook. I can bake just about anything but cooking is an entirely different playing field. In all my life, I can probably count on one hand how many times I've been able to actually whip up a meal... and eat it. I went through a quick phase a few years ago where I started collecting cookbooks because I really wanted to learn. Which is funny because you would think that having that experience of living on your own would mean learning how to cook but the sad truth is that my boyfriend did most of the cooking when we lived together. The only thing I cooked that came out decent was tilapia, which I just smothered in breadcrumbs. Pinterest is, hands down, my saving grace. As many other women know, Pinterest has taught me to style my clothes, style my (non-existent) childrens clothes, plan where to travel, plan my (also non-existent) wedding, decorate my future home, attempt DIY projects and COOK! And the last one is pretty important to me because it's part of my quest to bettering myself as a whole. A woman has got to know how to cook even the simplest of meals. Plain and simple. That delicious looking meal up above is an orzo scallop salad. Just to paint a picture of how little I know about the art of cooking, I spent about 20 minutes in the rice aisle at the grocery store looking for orzo. I was going by the picture on Pinterest and correct me if I'm wrong but orzo looks like rice, am I right? After checking-- and rechecking-- the rice shelves, I took out my phone and tried to search for where I could purchase the elusive orzo and then it popped up. Oh, it's pasta?! It's pasta! You idiot! So yeah, the orzo was only an aisle away from where I was standing. While the orzo is cooking, heat 1 tbsp olive oil in a skillet over medium- high heat. Saute the garlic for about 2 minutes. You just want to make sure you saute it until it's fragrant. When it's fragrant, go ahead and add in the tomatoes and peppers and cook about 5 minutes. The tomatoes and peppers should begin to char. 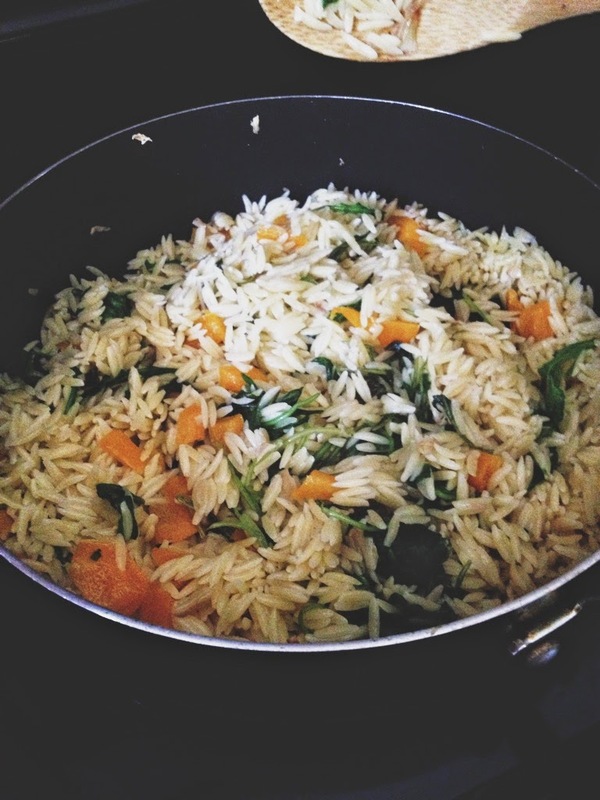 Combine the orzo, tomato, peppers, arugula and olives with the remaining olive oil and vinegar. Season it with a touch of salt and pepper for taste. 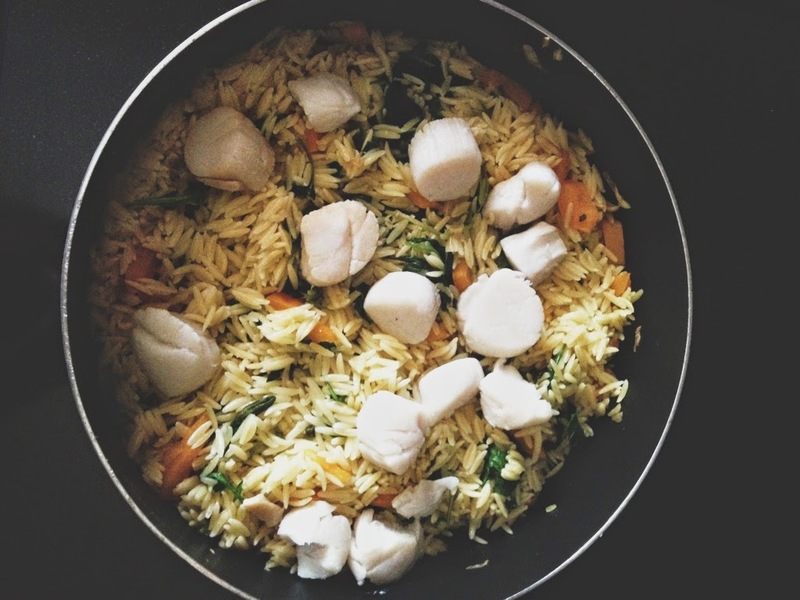 In a non-stick pan, sear the scallops over high heat. You can choose to grill the scallops too as an alternative. After 2-3 minutes, flip the scallops over to cook the other side but be careful to not overcook. No one likes hard scallops. 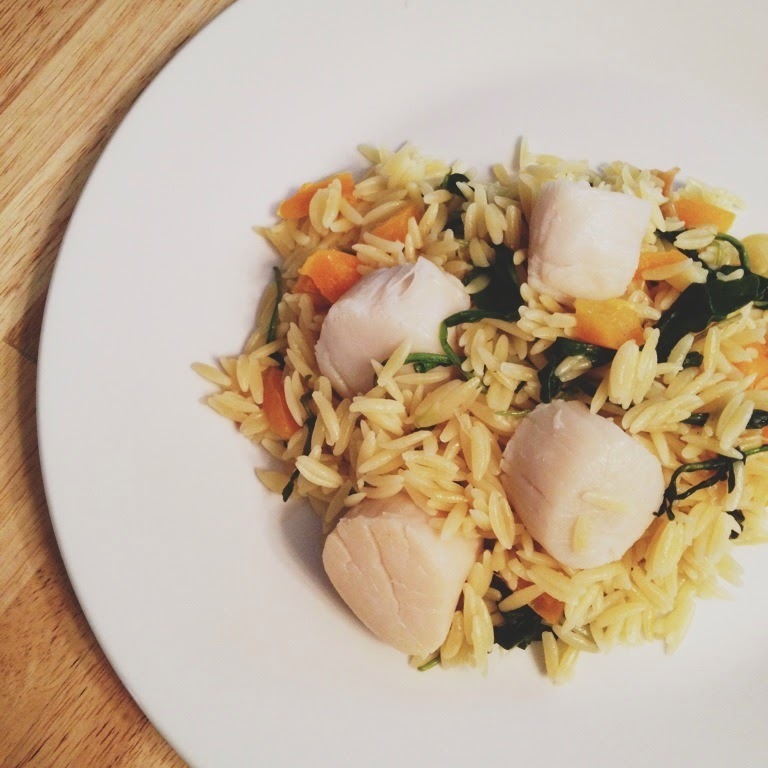 Top the orzo salad with scallops and ta-da! Holy ozone batman! The past few days have been hot. Really hot. Like this chica is en fuego kind of hot. Which is why I think this outfit was a stupid idea. A heat stroke death wish, if you will. The only explanation for why I'd choose to wear all black is because I'm crazy. In other news, can we talk about Craigslist for a moment? I'm currently looking for a new place to move into and it's been quite the lengthy process. I know I'm a late bloomer over here but this is actually my first time moving into a place with roommates. My first experience moving out was with my boyfriend years ago. I was hardly 22 and my living situation felt more like an actual home than what I'm attempting to do now. I'm still having a hard time understanding the concept of living with strangers and sharing living spaces with furniture that isn't even your own. So Craigslist. Is there any other reliable source out there that you have used that may be beneficial for this girl? Because so far, the search hasn't been working out really well for me. I really liked one of the places I visited but then I was told that I had to be able to cook dinner with everyone every Tuesday, go out for drinks on Fridays and list my favorite tv shows so it could be synced with everyone else's shows which everyone watched on Sundays. Another place I liked had a strange deal in which I was expected to not come home on weekends or that I would be sleeping elsewhere some days during the week. Which makes me wonder, why am I paying a good amount of money if I can't sleep there? And what the heck are you doing in that house that you feel like I shouldn't be around to see or know? And I know, what's so bad about cooking, hanging out and watching favorite tv shows with potential roomies? I don't have anything against it. I'd actually appreciate being able to get along with roommates except I kind of want a friendship to happen organically and if it fits with the crazy, rotating schedule that a nurse has. Sometimes after 12 hour shifts, you just want to go home, shower and pass out. I just didn't know the process of finding a place could be this hard. Don't even get me started on the, Oh you're not vegan? You don't work in international development? You're not a Pats fan? deal breakers some people seem to have. So yeah, Craigslist. Sometimes a strange place to venture in. But mostly, it's just interesting.